Gifted in Michigan | A SE Michigan in-person meet-up group for gifted children and their families! A SE Michigan in-person meet-up group for gifted children and their families! Would you like to attend the Michigan Renaissance Festival on the Festival Friday School Day Program, Friday, September 28th at a discount? Mensan Paul Hitch (paulnhitch@gmail.com) is organizing a group. You don’t have to be a Mensan or have a Mensan in your family to attend. Please contact Paul if you are interested, so that he can get a count (paulnhitch@gmail.com). Thank you! When you arrive at the festival, mention “Mensa group” at the ticket gate. For those who are unaware, the RG hotel registration website is having problems. They don’t anticipate the problems will be fixed prior to the RG, so we suggest you please register for your hotel room by phone instead. The phone # is 734-729-7555. Sorry for the inconvenience! Check out our website for full details on the kids’ track and registration information: http://mensadetroit.com. Please note that our Friday dinner meal will be a Taco Bar instead of pizza. Hope to see you there. SEMMantics starts tomorrow afternoon! Check out the lineup at this year’s Southeast Michigan Mensa Regional Gathering. Please note that the event will be at a new hotel this year, the Detroit Metro Airport Marriott in Romulus, Michigan. Register and get all the pertinent details here: http://mensadetroit.com/semmantics/. Please note that you’ll get a cheaper price if you register prior to April 8th, when the price goes up! Learn and Explore in the Kids’ Room! “Free Build” in the kids’ room with Legos, Snap Circuits, marble maze, puzzles, games, and life-sized Minecraft Blocks all weekend! Learn microscopy techniques, play with robots. Don’t forget to enter our weekend-long Lego-building contest. Judging right before our award’s ceremony Sunday morning! Let’s get to know each other over pizza with a mystery ice-breaker! Let’s build a marble maze we can use to play with all weekend. Bring your computer/tablet and questions! I will also speak on how to get/use a computer to meet your needs, how to keep viruses, ransomware and malware from spoiling your fun, how to safely download and install Minecraft mods, how to play XBOX games on your Windows 10 PC, etc. Let’s let loose in the pool and have some fun! Kids’ participate in the chocolate feast. Get your chocolate fix! Electrical and Mechanical Take-It-Apart party complete with all our old stuff! This will give your kids a chance to see what makes common household items tick, such as computers, old cell phones, appliances, plumbing, etc. Bose engineer, Will Robinson presents a brief tutorial on electromagnetics and acoustics in preparation for his “Build a Speaker” workshop. Bose Engineer, Will Robinson, teaches workshop attendees how to build a simple speaker out of a paper plate. Let’s have some fun singing alone or together just for fun! Let’s get some choruses and duets going too! We will use our Karaoke machine with mobile devices again this year. Use ours or bring your own. This year our iPad will use a Karaoke app to make your song selection easier! Join Dave, Martin (15), and Heather (12) on an interactive slide trip around the world. The children will see and discuss the Tower of London, Eiffel Tower, Pyramids, and other famous places they often recognize. It’s a great geography lesson and shows how kids can enjoy international travel. This talk is for kids of all ages. Have you ever wondered what happens when you get your blood taken at the doctor’s office and it gets tested? What does the lab tech check for to make sure you are healthy? A blood smear has several indicators that can be used to predict your overall health. Make, stain and learn to interpret a slide of your own blood. Let’s party at the kids dance! Dancers bring your best moves for the dance competition. Musicians (Karaoke singer(s) or homemade band), sign up in 15 minute increments. Signups begin at the beginning of the RG. Kids and Adult Musicians are welcome! Here’s your chance to figure out all the logistics for a home built on Mars or other outer space world. What material do you need to use? How will you oxygenate your home, heat/cool your home? How will you provide water/food and entertainment in your home? You figure it out and then build it! Let’s construct a natural cedar birdhouse that you can use to attract birds to your backyard. We will be making basic bluebird houses and learning more about attracting and observing songbirds! 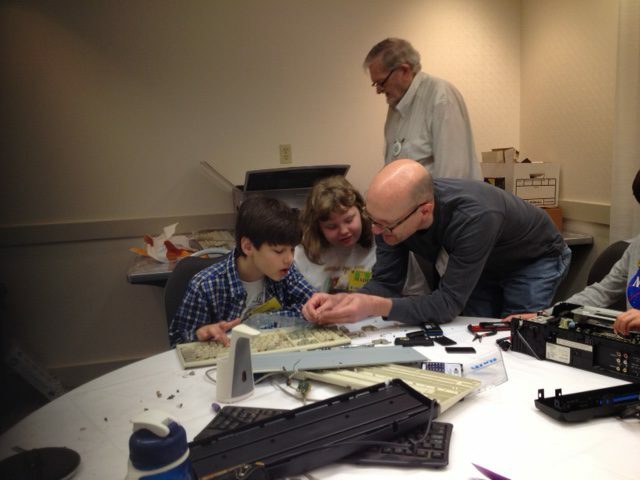 Be sure to finish your Lego Contest projects by 11:00 a.m. Sunday. We will line them up then for the judging session! Steppingstone School in Farmington is having a talk this Thursday 9/29 at 7:00pm. “Parenting Gifted Children to Reach Their Full Potential” with Tom Clynes, author of The Boy Who Played With Fusion. Please see the presentation flyer for more info. The greatest inventors of all time knew that great innovation comes from an open mind filled with imagination, curiosity and wonder. When we are born, the world around us is truly a magical place. Everything is new. The world is one giant tinker box set in front of us to be explored. Gifted children hold onto this beautiful gift as they grow and they are natural inventors and innovators. Gifted children tend to accelerate even deeper into the world of tinkering, figuring out how things work, inventing new things and improving upon existing things. For these children and teens, Maker Faire is a rich haven for them to immerse themselves into and spend hours exploring. Last year was the first time my family visited the Maker Faire at The Henry Ford. There is a plethora of tech-based vendors who fill most of the museum inside and have an even larger presence outside. There is so much to see and do there. Many vendors go beyond offering just literature and business cards and provide hands on demonstrations and activities for adult and children tech fans alike. This is a smorgasbord of brain food for gifted children and teens. Last year, my son met a teacher at Maker Faire who has become a mentor to him. Keith Young, owner of Kinvert, has taken my son’s dream of creating his own working R2 unit and mapped out a path for my son to achieve his goal. At just 8 years old, my son, like most gifted children, has big dreams. Kinvert is a relatively new company, but already Keith is leading our gifted children toward their goals in such a short amount of time. He offers hands on learning with a lot of child led invention and innovation. This year, Keith is offering an amazing opportunity to children and teens that exhibit advanced abilities or interest in robotics, electronics and programming and have the ability to work in a team environment. He is holding a robotics competition complete with lessons to prepare the teams on their quests of SumoBot battling. The teams of up to 5 children will work together to learn how to code the robot to leverage sensors in order to locate the competitor’s robot and locate the edge of the arena ring to try to be the first to push the competitor’s SumoBot out of the ring to win the match! What makes this learning experience and competition unique is that the kids will not be controlling the robots directly through a remote control. Instead, they will learn directly from Keith how to program the robot to make decisions on its own and operate autonomously using sensors. The kids will then present their skills at Maker Faire 2016 at The Henry Ford. Teams will compete there for great prizes and fun while being encouraged to learn not only team work, but the value of helping others as they learn together. This is like a dream opportunity for so many gifted children and teens. They will learn robotics, electronics, coding and life skills from a highly educated and experienced coach and teacher. Keith holds two engineering degrees and has won two robotics competitions at the graduate level! As a gifted individual himself, Keith “gets” gifted children and teens. He is able to encourage a 5 year old to take her or his learning to any level the child desires without the age assumptions often placed on these kids. He can help them through asynchronous abilities so they don’t have to stop coding just because they are struggling in one area or another. As a gifted teen, it’s often difficult to connect with those who share like interests and it can feel lonely and isolating to have such a deep passion, but no one who speaks your same language. Keith has taken on this problem and has worked diligently to bring together teens who share common interests and speak the language of all things tech-y. He supports his students to learn by exploration which promotes learning how to accept mistakes and getting back to it to try again. Finding a gifted instructor for our gifted children is rare. Keith is an exceptional find.